Enjoy outdoor living with a spacious outdoor space like what this home features. As always, we would want to have a certain spot in our house where we can relax and unwind. Most of the time, it could be a small seating area in the backyard, the rooftop and other spaces. But it would definitely be nicer if you have a spacious outdoor space where you can enjoy outdoor living from morning till night. In most cases, these areas would have a swimming pool, an outdoor living area and a kitchen. This way, you could take advantage of the space all day long. Some would even add an outdoor bar as well. What we are going to feature today is a home which allows the family to enjoy the outdoor area. 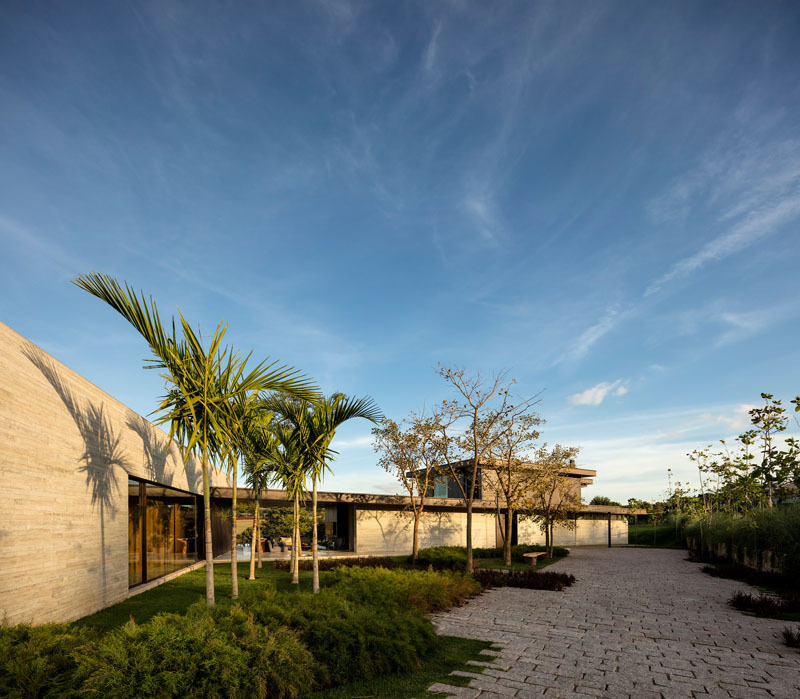 In accordance with the proprietors’ desires, an essential parameter guided the undertaking for this farmhouse in Porto Feliz, São Paulo: to make a nation home that underscored its reconciliation with the scene, ideally by method for a lightweight structure, with extensive openings and coated surfaces. 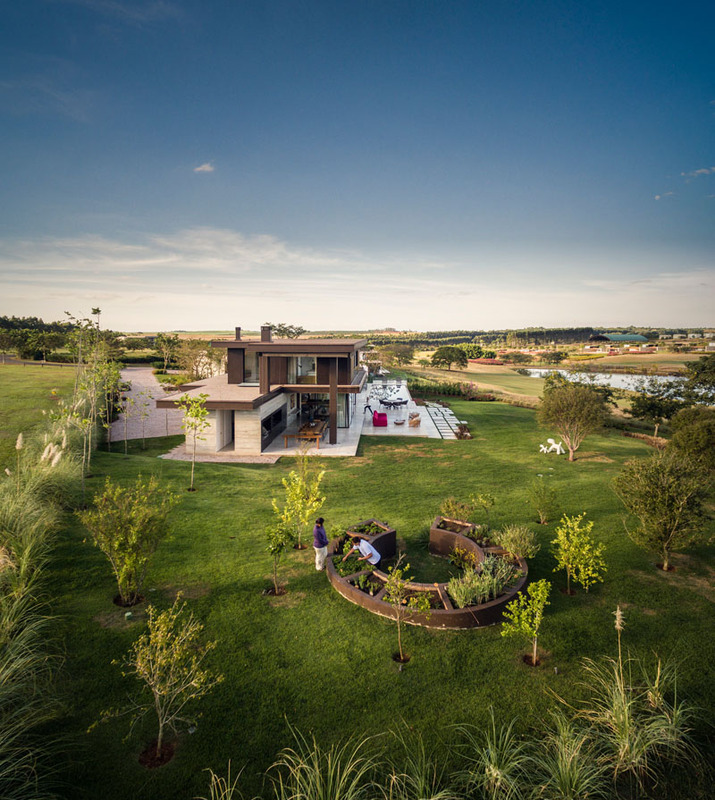 So the design made for Fazenda Boa Vista contrasts from the encompassing houses, for its contemporary dialect and basic strength. Measuring 700m², the steel confined house takes after the state of the territory. The spaces, thus, were laid out in order to offer a perspective of the lake and the green from each and every one. 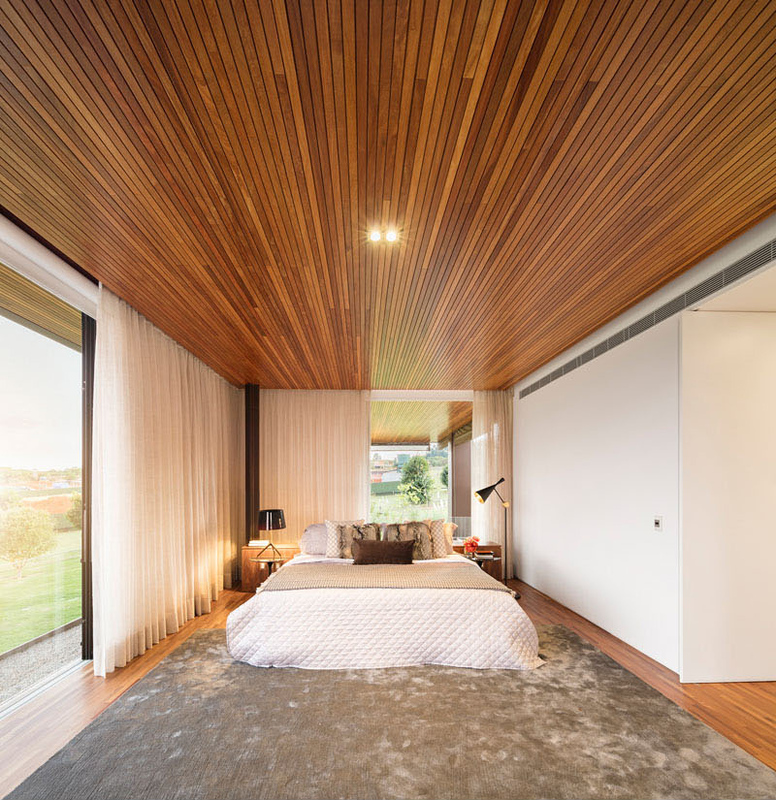 The entire façade is produced using consistent sliding sheets. Few and refined materials, for example, wood, stone and glass reaffirm the undertaking’s centrality. At dusk it turns out to be totally porous to the perspective: a huge light box thought about the swimming pool water. Here are images of the house both for its interior and exterior. 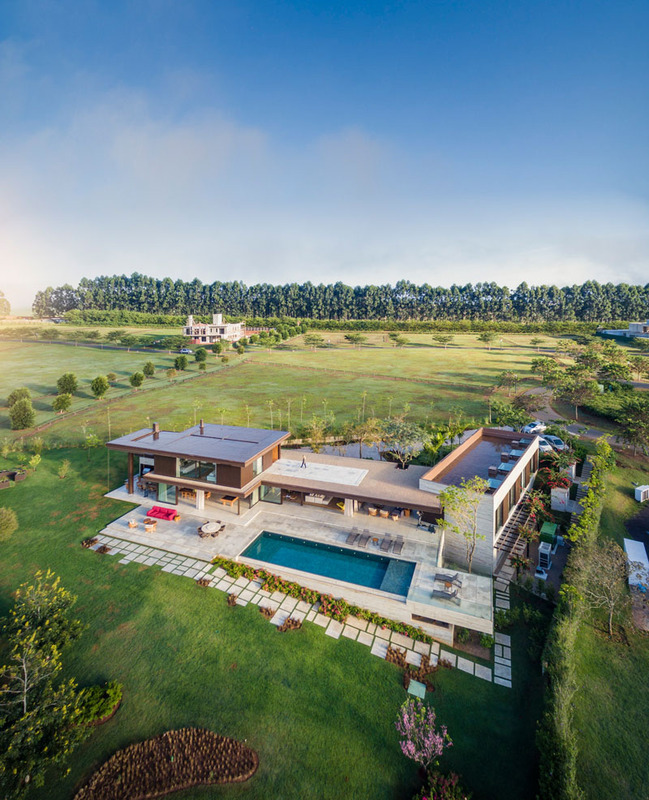 Unique feature: A beautiful contemporary house with a spacious outdoor area with a pool, outdoor kitchen and others. 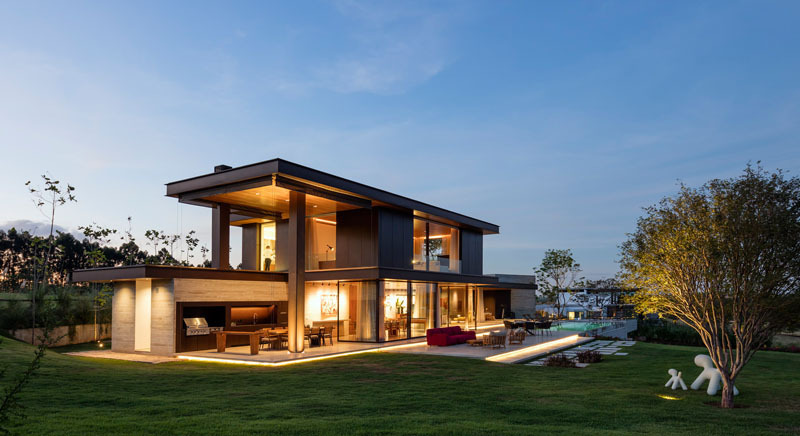 This contemporary house in São Paulo, Brazil, takes advantage of the views and outdoor lifestyle. It features a large backyard, swimming pool, outdoor kitchen and dining area, as well as an outdoor lounge. 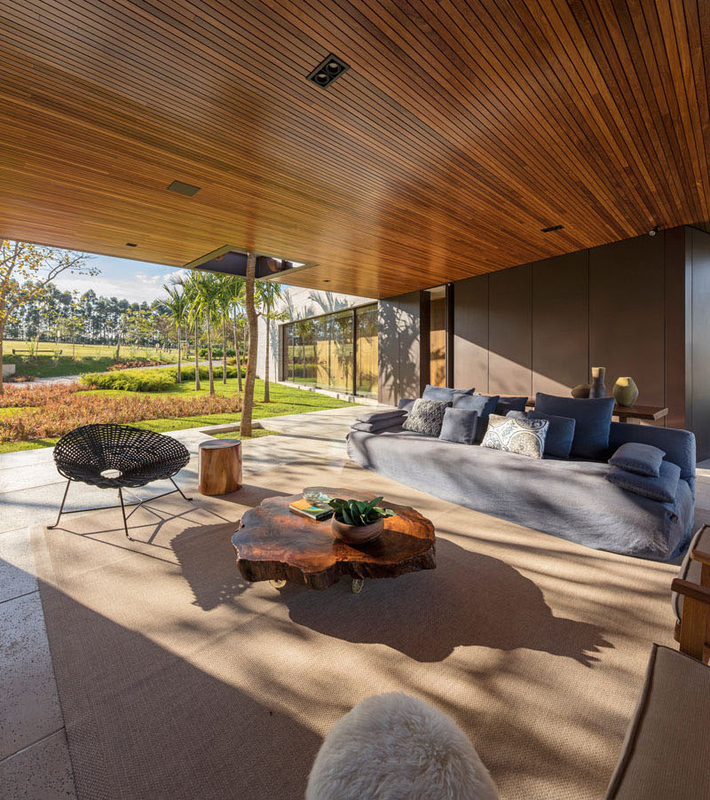 The home is designed by Fernanda Marques Arquitetos Associados featuring two volumes separated by the outdoor lounge, the main one, where the living area, kitchen and master suite are and the side one, with suites for visiting guests. Seen here is an overview of the home. You can clearly see the two sections, as well as the layout of the backyard and outdoor spaces. Isn’t this very nice? I like how the layout is done here. You can also see the rooftop too. At night, the stone covered outdoor areas are outlined with hidden lighting which looks really stunning. The swimming pool is stepped down slightly from the house, and lighting is hidden within the steps to create a very nice atmosphere at night. This space looks really inviting, right? Off the top floor, there is a rooftop patio to take advantage of the views in the area. 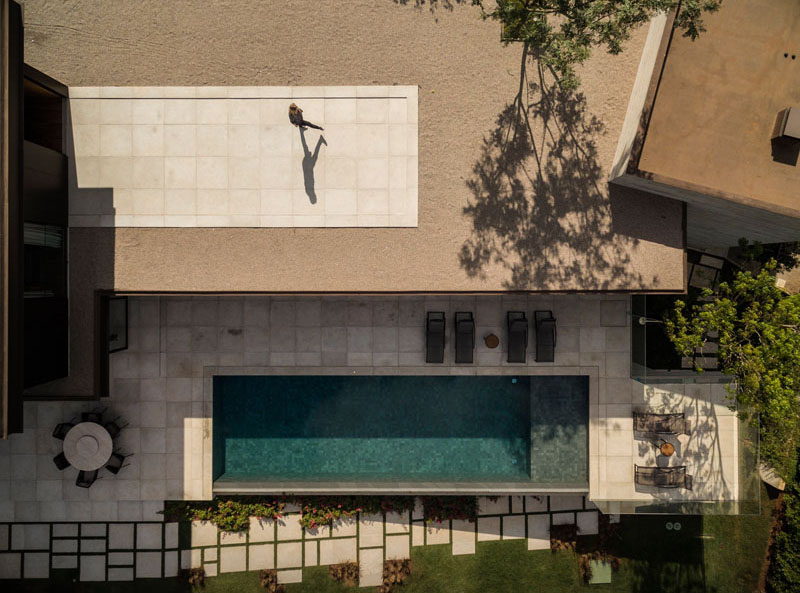 You can see that the pool area has a simple design with rectangular and squar-ish pavers around it. Another impressive feature of the house is this tree in it. A small section of the floor, ceiling and roof was removed to allow a tree to grow through it. I always wanted to use this idea for the house. 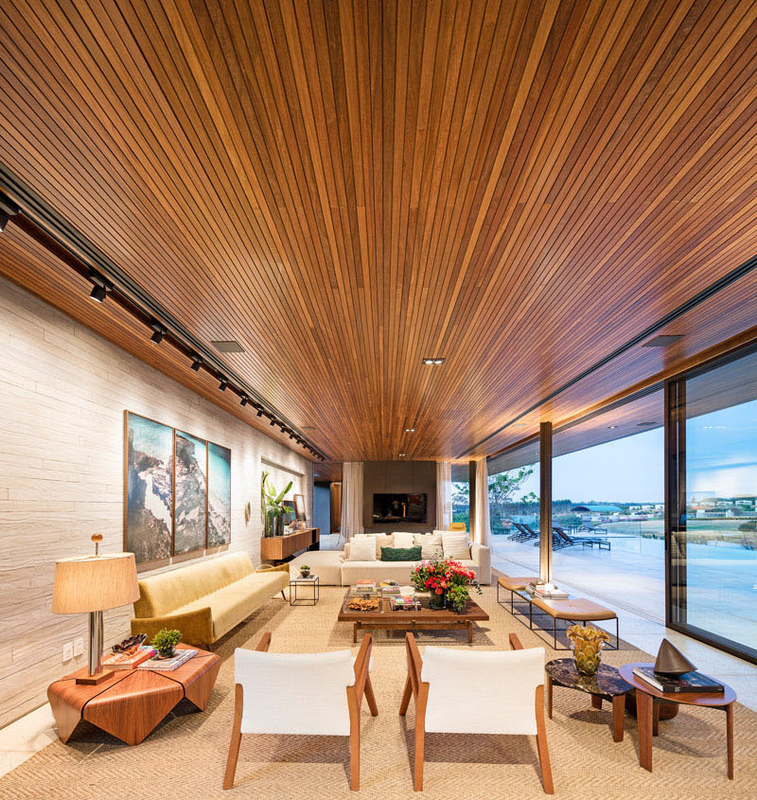 Inside the home, the ceiling is secured in wood and the vast glass entryways open for immediate access to the outside zones. Alongside the swimming pool is an open air lounge territory, with TV and fireplace, and a wooden ceiling that ventures to every part of the length of the house. 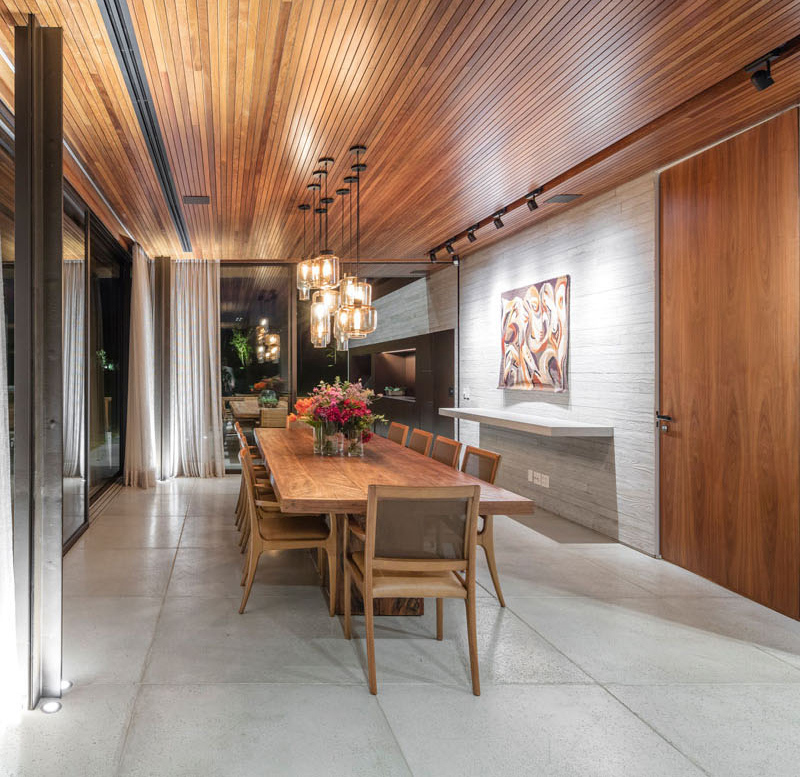 Multiple pendant lights define the dining area. You can also see that there is a simple floating sideboard that rests under a highlighted piece of art. Just off the dining room is an outdoor kitchen and large dining area that is perfect for entertaining. Aside from that, there is also a dedicated spot for playing pool just next to the dining room. One element in the house that is definitely impressive is the staircase. You can see here different angles of the stairs. On one angle, it may appear like a mere black staircase but it isn’t. The stairs and handrail are actually made from wood. But that’s not all, there is also lighting that wraps its way up the stairs, hidden between the stairs and the handrail. 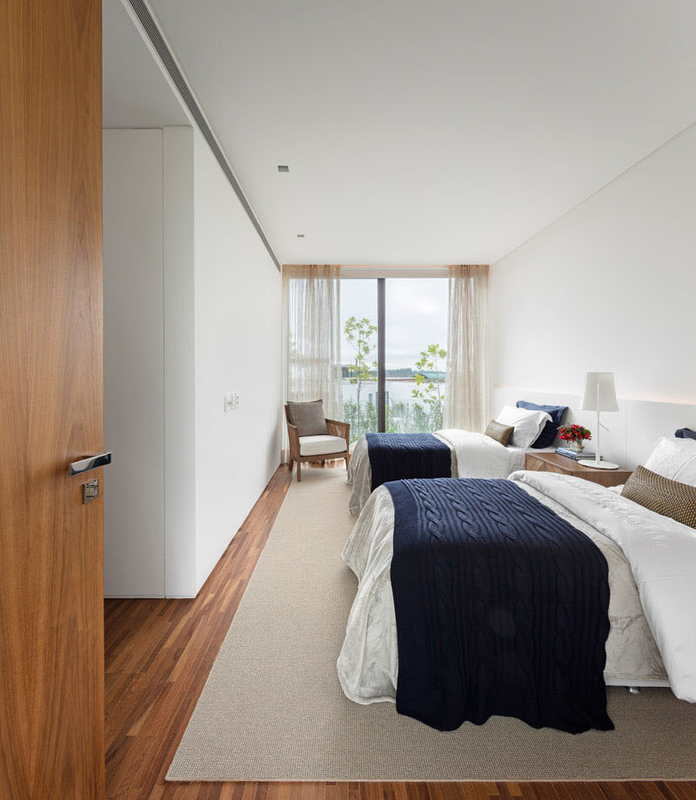 In the upper level of the house, there are bedrooms like this one, that has white walls with soft lighting hidden behind the custom-built headboard that runs the length of the room. What I love here are the different textures used in the space. This is the second bedroom that has been set up as a guest room with two beds. If I were a guest in this house, I would feel very welcome in this bedroom because just look at how lovely it looks like despite the simple colors and textures used in it. 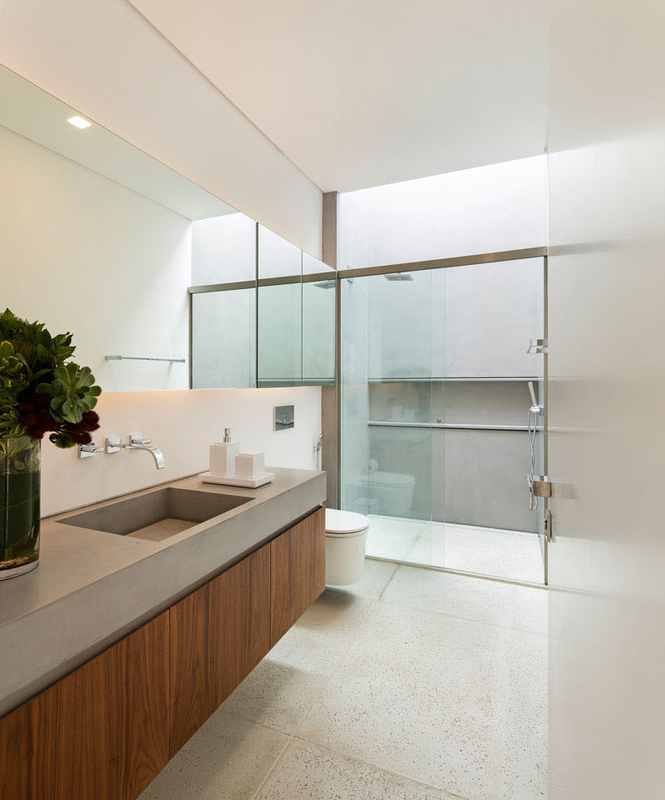 In the ensuite bathroom, there’s a vanity with a solitary sink, and a walk-in shower with bunches of light from a skylight. In the main restroom, there’s a double sink vanity, and a tall window, however don’t stress, it gets to be iced when required for privacy. Here’s another view of the house which shows us the outdoor space. You can see here a custom built circular vegetable garden. It does look something like what we can see in parks! I like the architecture of the house because it looks just simple but definitely elegant. Who would resist a home like this? But what I love more is the outdoor space. I always wanted to have a house that have a spacious outdoor area where the kids can run and play safely and where we can add a pool, a fire pit and all. It would definitely be very relaxing to have an outdoor space in your own home especially if the garden is well landscaped. 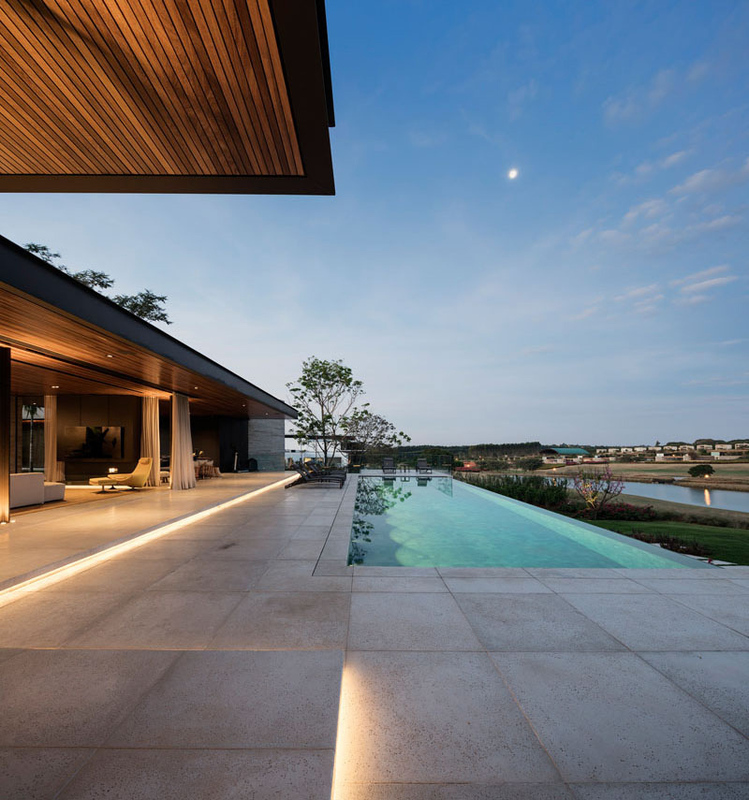 This home is a project by Fernanda Marques Arquitetos Associados who successfully designed a beautiful modern contemporary house for the family, giving them everything that they want to for a home. Well, a home similar to this is what I want. How about you?